First unveiled as a concept two years ago, the production model's unique shape houses some remarkable technology. F'rinstance, an active rear spoiler, a Twin-Scroll turbocharger, direct petrol injection, variable valve lift and variable valve timing, Hill Assist to facilitate maneuvers on steep gradients, an intelligent traction control system (ASR), electronic brake force distribution (EBFD) and emergency brake assist (EBA). There's also a concept RCZ Hybrid4 which uses a 120 kW 2.0-liter HDi FAP diesel engine at the front and a 27 kW electric motor at the rear to deliver 70 mpg. Three engines will initially find a place under the aluminum bonnet of the RCZ – all complying with the Euro 5 emissions standard. A new 1.6-liter turbocharged petrol engine has been developed for the RCZ, producing maximum power of 147 kW at 5800 rpm and maximum torque of 255 Nm at 1700 rpm (or 275 with overboost). The RCZ benefits from dynamic acceleration – 80 to 120 kph in 6.5 seconds in fifth gear, and 0 to 100 kph in 7.6 seconds – while fuel consumption does not exceed 7.1 liters/100 km in the combined cycle (less than 165 g/km of CO2). This 4-cylinder engine combines all of the most recent technology to create a world first: a Twin-Scroll turbocharger for performance and instant response at very low engine speeds, direct petrol injection, and variable valve lift coupled with variable valve timing on the intake and exhaust camshafts (VTi technology), for reduced fuel consumption and CO2 emissions. The RCZ will also be available with Peugeot’s HDi FAP technology via a 2.0-liter engine developing maximum power of 120 kW at 3750 rpm and generous maximum torque of 340 Nm at 2000 rpm. To obtain this level of performance it has a new generation ECCS (Extreme Conventional Combustion System) combustion chamber, a variable-geometry low-inertia turbocharger, a high-pressure pump allowing a pressure of 2000 bar in the common rail and solenoid injectors with eight apertures. This engine offers wide scope for driving enjoyment, despite limiting fuel consumption to just 5.4 liters/100 km in the combined cycle, with CO2 emissions of 139 g/km. A second petrol engine is available in the form of a 1.6-liter turbocharged direct-injection unit that achieves 240 Nm from 1400 rpm and 115 kW at 5800 rpm. It offers fuel consumption of 6.9 liters/100 km and 159 g/km of CO2 with a manual gearbox. The RCZ benefits fundamentally from a highly efficient suspension set-up developed from the existing 308 range (McPherson type front suspension and rear torsion beam). In addition, the car’s ride height and center of gravity have been lowered by 20 mm and 40 mm respectively, while the RCZ is wider (+ 30 mm) with wider front and rear tracks (+ 54 mm and + 72 mm). The suspension and dampers have been adapted accordingly and, with the addition of wider tires on 18 or 19-inch wheels, the end result is road-holding of the very highest order. On models featuring the 147 kW engine, the front axle incorporates a special lower anti-roll bar to make the car even more responsive and agile. Braking, meanwhile, is powerful and durable and is assured by ventilated discs with a diameter of 302 mm and a thickness of 26 mm. The 147 kW model receives discs of 340x30mm. All models are equipped with rear brake discs with a diameter of 290x12 mm. To facilitate maneuvers on steep gradients, all versions of the RCZ come with Hill Assist. This function is coupled as standard with ESP which, except on versions with an automatic gearbox, includes an intelligent traction control system (ASR), dynamic stability control (DSC), electronic brake force distribution (EBFD) and emergency brake assist (EBA). The DSC, ASR and EBA functions can be disconnected simultaneously (ESP Off) so that experienced and demanding drivers can fully exploit the car’s capabilities. An active rear spoiler also contributes to the already impressive aerodynamic efficiency of the RCZ’s slippery shape – it can be deployed in two positions according to the speed of the car, to ensure an ideal balance between road holding and fuel consumption. Deeply contoured bucket seats, a sports-themed dash and a jewel-look analog clock make for an inviting cabin. The RCZ also offers versatility, with the boot offering a capacity of 384 litres with additional storage spaces under the floor – this can be increased by folding the rear seat backs down, giving a maximum boot volume of 760 liters. There are also two occasional seats, fully sculpted and perfectly usable, especially since the design of the roof with its double bubble offers extra headroom to these occasional rear passengers. 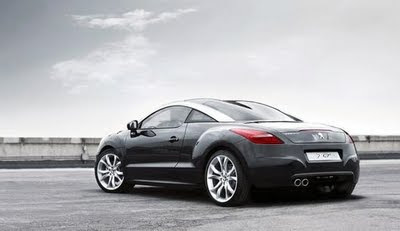 The RCZ will be assembled at the Magna Steyr plant in Graz, Austria – a production center that specializes in exclusive vehicles.